While many chemical fluid-transfer operations may take place in harsh environmental conditions, the pumps and systems used to facilitate product transfer are in actuality delicate ecosystems that must be kept in balance and operate in harmony. Therefore, any upset in the system—including improper shaft alignment—can result in breakdowns that can lead to excessive downtime and high repair or replacement costs. The general impression is that the pumping systems used in high-volume, heavy-duty chemical fluid-transfer applications are rough-and-tumble beasts, able to, as the old Timex watch television commercials used to promise, “take a licking and keep on ticking.” In reality, they are delicate ecosystems in which all of the components must be kept in balance and operate in harmony, lest system failures and breakdowns occur that will lead to excessive downtime and repair or replacement costs. In today’s chemical-transfer universe, some estimates say that centrifugal-style pumps with motor-speed capabilities are the choice of operators as much as 75 percent of the time in critical chemical fluid-transfer applications. 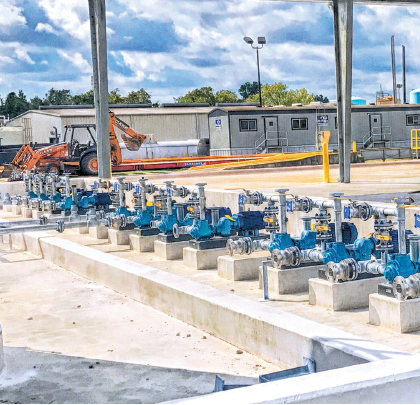 However, this article will illustrate how recent advancements in the design and operation of another type of pump technology—positive displacement sliding vane—can be a more efficient, reliable and safer option when transferring critical chemicals in both fixed and portable systems. Any pumps that require the mating of shafts to a gear reducer or pump motor must be aligned properly. Failure to do so will eventually lead to shaft fatigue and failure that will knock the pump out of service and halt production operations. It’s an unavoidable fact of pump operation: mating shafts require alignment. Perhaps it is a direct-coupled pump with alignment between the motor and pump. Or a reduced-speed pump with alignment between the gear motor and pump. In either case, a coupler or multiple couplers transfer torque from the prime mover to the pump, possibly through an intermediate speed-reduction device. Each of these components (motor, gear reducer, and pump) must be accurately leveled so they align the shaft centerlines. Once leveled, each component must be carefully positioned to eliminate all angular and axial offsets. Couplings are installed only after these steps are complete. There are many coupling types. Some couplings are more forgiving to misalignment than others, but each will fail if careful alignment procedures are not performed. This causes expensive downtime, lost reliability and increased maintenance expenses. Shaft fatigue is an additional consideration. Initially, a misaligned shaft will absorb the induced load. That load is transferred two times per revolution, which is even more significant at motor speeds of 1,800 rpm. Several hours later, that shaft has absorbed tens of thousands of cycles. Eventually, the stress from repeated load-deflection cycles will cause the shaft to fail. When the shaft breaks, the downtime is problematic for end users, because the pump unit is not moving fluid and production schedules are not met. The nirvana for pump operators is a set-and-forget system that eliminates any chance of the shafts coming out of alignment, but the reality is that there are a wide variety of things—both operationally and in the way the pump is handled—that will cause pumps to fall out of alignment. The first is vibration, which occurs whenever a pump operates. It’s undeniable that some amount of vibration will take place when a pump is running; it is when the level of vibration is excessive that components loosen and cause the shafts to come out of alignment. A second major cause of misalignment is maintenance. When pump or system maintenance is required, the pump is often decoupled from the motor. If the reinstallation is done in haste, the pump will be out of alignment when recoupled. This could be caused by a technician that has not been properly trained, or perhaps by someone who is rushing to complete the job because he has been stretched thin. In either case, that technician will be surprised by an unexpected and urgent maintenance event when that shaft or couplings fail. Simply put, the shafts must be properly realigned every time the pump unit is maintained or relocated. The ultimate repercussion of a misaligned shaft is that the shaft or the coupling will eventually break or fail, which will necessitate the need for another costly maintenance call to either repair or replace the pump, all while the downtime is hampering the producer’s ability to meet the requirements of strict production cycles. Some pump manufacturers have been able to work around vibration problems or misaligned shafts with the development of close-coupled motors, where the motor shaft also operates as the pump shaft, a design that is popular with centrifugal pumps. While this design does eliminate the need for shaft alignment, the operational window of close-coupled pumps is relatively small (require clean liquids, cannot run dry, small viscosity range, sensitive to high vapor-pressure liquids), which does not make them viable for use in most chemical-handling applications. The design of the new Blackmer® GNX Series Sliding Vane Pump eliminates the couplings between the gearbox and the pump and motor by rigidly connecting them in alignment with a C-face (or similar) motor on both the high-speed and low-speed sides of the setup. The result is a pump that will not need to be realigned either at initial installation or following a maintenance procedure, resulting in improved peace of mind for the operator. Recognizing the various shortcomings of centrifugal pumps, as well as the deleterious effects caused by shaft misalignment, the search has been on for a technology that can be classed as “alignment free,” while still possessing the ability to deliver the high flow rates and transfer volumes that are the backbone of chemical fluid-transfer operations. In essence, what was needed was a design that eliminates the couplings between the gearbox and the pump and motor by structurally connecting them rigidly in alignment with a C-face (or similar) motor on both the high-speed (or motor) and low-speed (or pump) sides of the setup. Blackmer® has found the solution with its new GNX Series Sliding Vane Pump. 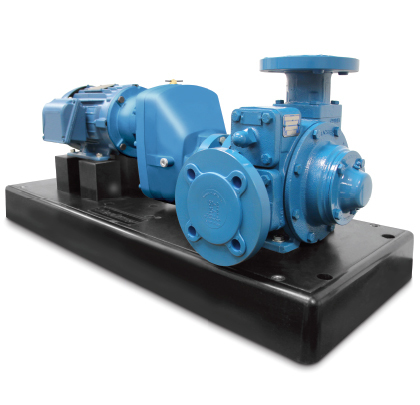 The GNX Series pumps are an enhancement of Blackmer’s legacy GX Series models, which have been in service since 1959 and are cast-iron pumps with an internal gear reducer for use in the transfer of various chemicals. The GNX pumps use the proven features of the GX pumps and take them to the next level with the incorporation of a commercial-grade, single-stage gearbox. This innovative new gearbox fits between the motor and pump and is held in place by a permanent dowelled connection that creates a structural link between the high-speed and low-speed sides of the system. This redesigned gearbox is constructed of rigid aluminum housings (for 2 to 2.5-inch pumps) and cast-iron housings (for 3 to 4-inch pumps) and has NEMA C-face or IEC D-flange motor-input connections. The gearbox output has a proprietary hollow shaft that is compatible with the pump’s keyed shaft. This capability results in the industry’s first alignment-free pump that can produce flow rates from 20 to 500 gallons per minute. The alignment-free design is well suited for both fixed and portable applications with the gearbox possessing the ability to create turndown ratios ranging from 2:1 to 13:1, resulting in more precise flow rates. Typical commercial-grade gearboxes have more moving parts and a beefier housing, which can result in higher purchase costs. Many rely on two-stage or three-stage speed reduction, which means that the lowest speed ratios between the high- and low-speed sides of the system are 3.0 or 4.0. This creates a maximum pumping speed that is usually less than 600 revolutions per minute (rpm), which is not enough for the demands of high-volume fluid-transfer operations. The new GNX pumps have also been designed to fit into the same footprint as the original GX pumps. 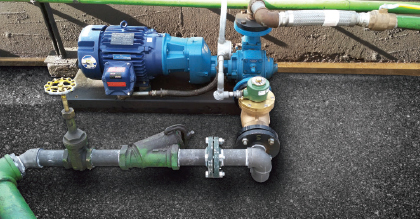 This allows the alignment-free pumps to retain a compact footprint and to be a drop-in replacement in existing installations. The GNX features a traditional 90-degree ported option; the new GNXH model offers a new 180-degree ported option for use wherever horizontal discharge piping or vertical pump mounts are desired. A final benefit of the alignment-free pumps is that the permanently connected gearbox eliminates all couplings and allows all rotating components to be totally enclosed without the need of guards. 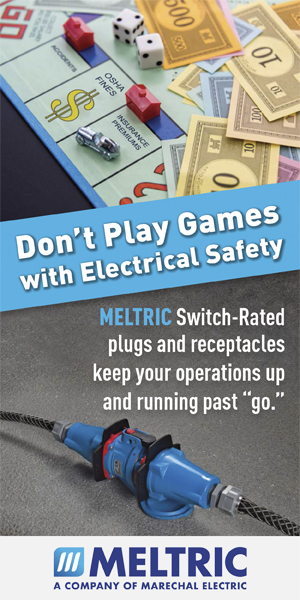 This eliminates pinch points for the operator or technician, resulting in improved safety. Furthermore, seal leakage and product spillage are reduced by incorporating Blackmer’s locked-rotor design into the GNX pumps (which was not available on the legacy GX pumps). These safety improvements are important to successfully pass U.S. Occupational Safety and Health Administration (OSHA) inspections or audits as well as those utilized by other governments globally. Operationally, the alignment-free pumps maintain the best traits of the legacy series, namely the high efficiency and dry-run capability, without damage during the self-priming or line-stripping stages. Other benefits of the alignment-free pumps include integral head-mounted drive with oil-lubricated, helical gears; sliding-vane pump design that adjusts for wear to maintain flow rates; and adjustable relief valve for protection against excessive pressures. This combination of time-proven operational features and the new alignment-free gearbox means that the pumps will deliver increased reliability, uptime, seal life, bearing life, shaft life, and safety, with decreased and simplified maintenance. The permanently connected gearbox in the Blackmer® GNX Series Sliding Vane Pump eliminates all couplings and allows all rotating components to be totally enclosed without the need of guards, which makes it the industry’s first truly alignment-free pump. 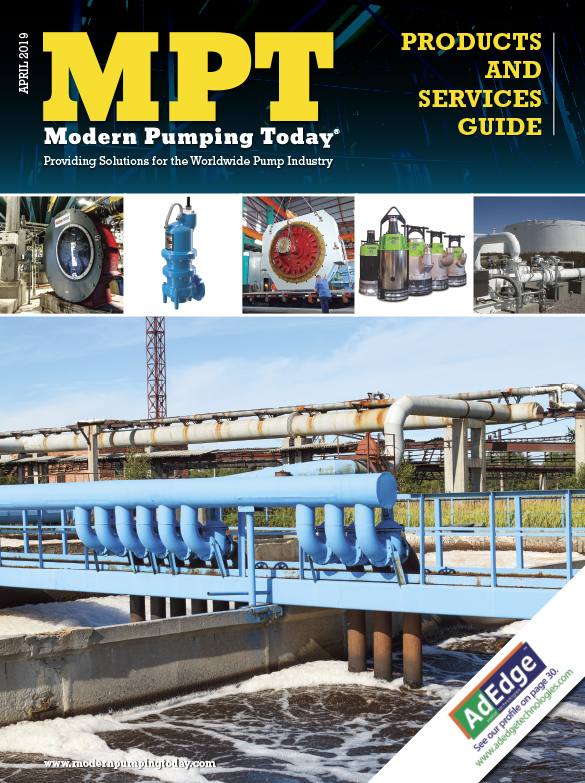 We may think of pumps as rugged, robust pieces of machinery—and, when operated in a vacuum, they are—but because pristine operating conditions are rarely achieved, it is imperative that pumping systems are designed and operated in a way that reduces the amount of harmful stress placed on components. One area that has been difficult to achieve and maintain is shaft alignment, but with its new alignment-free GNX Series Sliding Vane Pump design, Blackmer anticipates that this worry may soon become a thing of the past. Geoff VanLeeuwen is a product manager for Blackmer® and PSG®. He can be reached at geoff.vanleeuwen@psgdover.com. For more information on Blackmer’s full line of pumps and compressors, visit www.blackmer.com or call 616.241.1611. Blackmer is a product brand of PSG®, a Dover company, Oakbrook Terrace, Illinois. 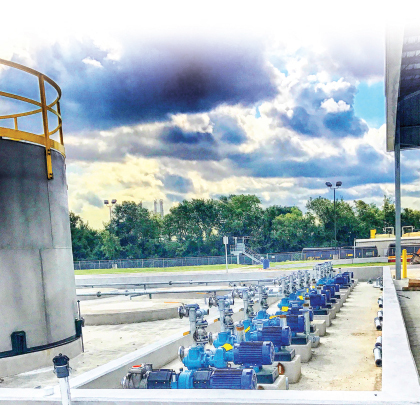 PSG is comprised of several of the world’s leading pump brands, including Abaque®, Almatec®, Blackmer®, Ebsray®, EnviroGear®, Finder, Griswold™, Mouvex®, Neptune™, Quattroflow™, RedScrew™, and Wilden®. You can find more information about PSG at www.psgdover.com.